I know it’s officially summertime in the Northwest, even though the weather has been cold, wet, and generally grey all month. Strawberries are ripe in the fields, but they look forlorn, and I am strangely uninterested. It’s COLD, and there is this growing emotional need for something indulgent, nostalgic, and comforting. A strawberry isn’t going to do it. 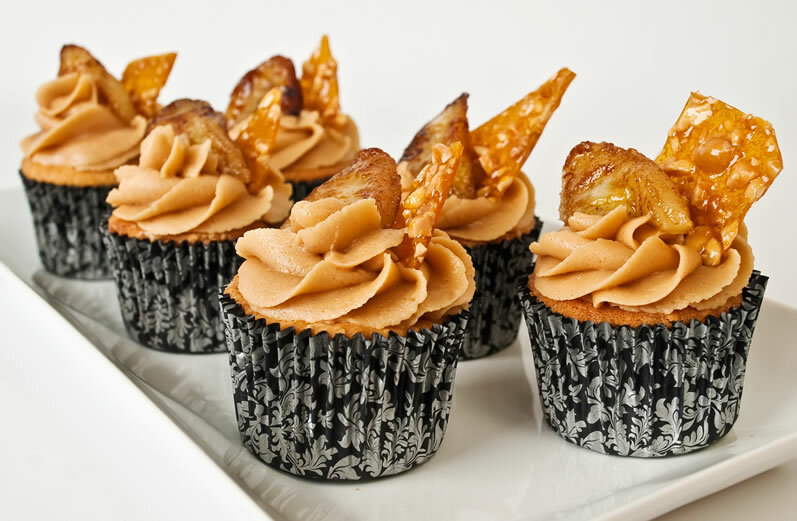 I should be eating sprightly salads bursting with all the freshness of early summer, but instead I want cupcakes—golden, tender, completely decadent–peanut butter cupcakes–loaded with swirls of, you guessed it, creamy, dreamy peanut butter frosting. So I try a couple of recipes from here and there, but the texture isn’t quite light and moist enough. Then the fine-tuning begins. I switch from sour cream to buttermilk and the texture is hugely improved. I increase the liquid measurement to lighten the batter just a bit more. The cupcakes need more sugar, so another test ensues. And finally, in goes a little more peanut butter as well. The result? 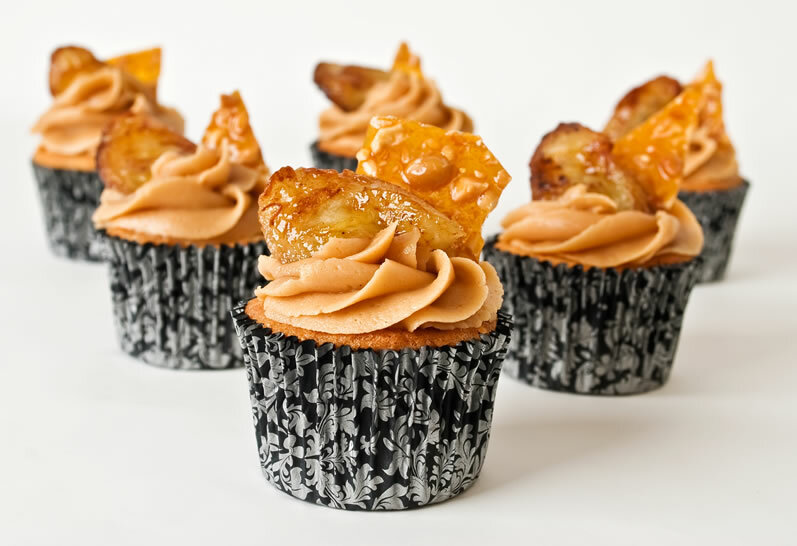 The best dammed peanut butter cupcakes I have ever eaten. I kid you not! These cupcakes are so light, tender, and moist, they are now my new standard. And when you add the incredibly light and creamy frosting, you will think you have died and gone to heaven. 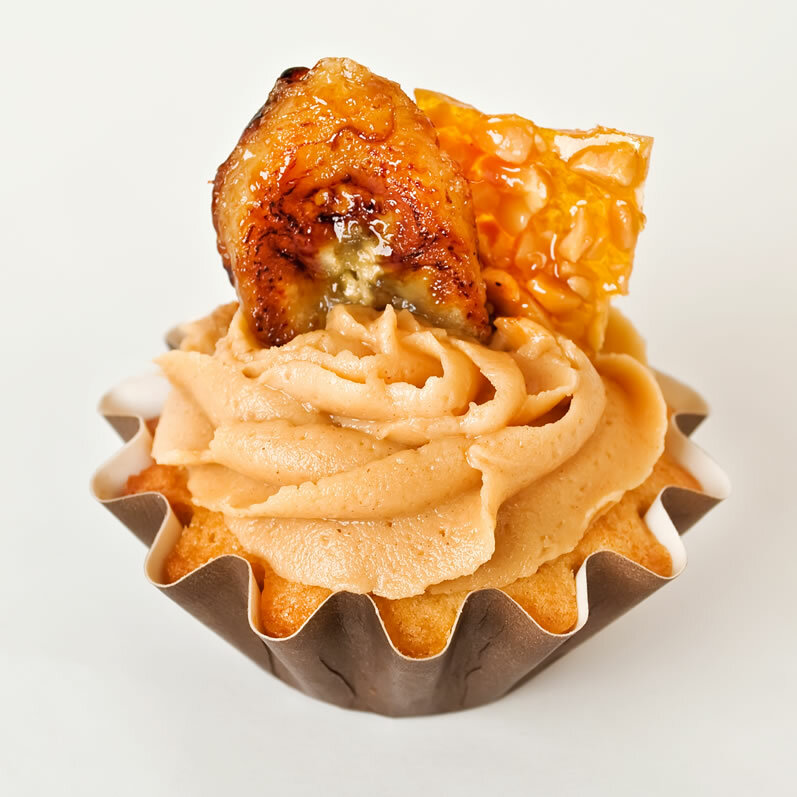 You can stop right there if you like, a simple cupcake with a simple frosting, but for special occasions, the praline and caramelized bananas add a very special touch. Or, if you happen to have homemade caramel sauce on hand, swirl a little of that onto the frosted cupcakes. 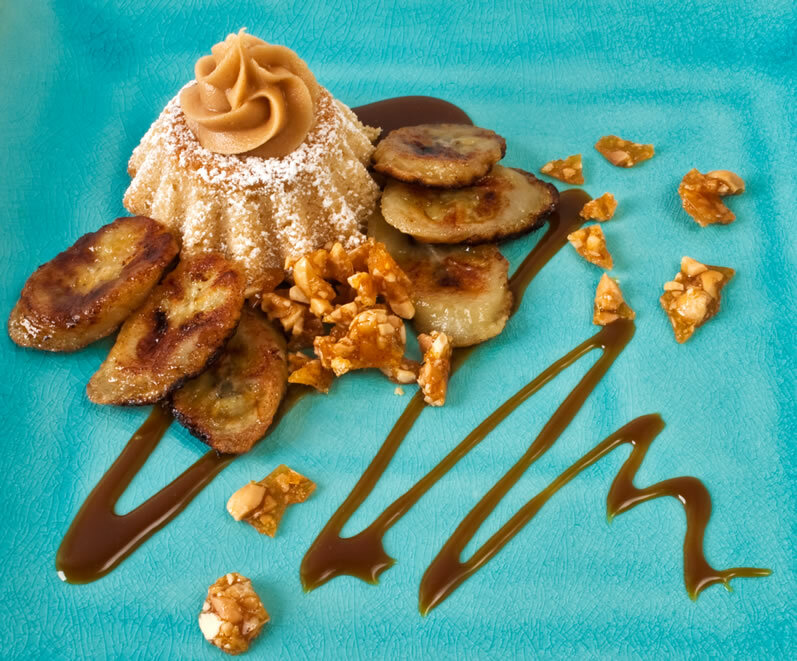 If you really want to gild the lily though, serve the cakes upside-down on dessert plates garnished with frosting, praline, bananas, and a drizzle of caramel sauce. And be prepared for applause. These cupcakes are simply spectacular, but they are definitely a bit of work if you want to include the garnishes. For the full effect, you can make things easier on yourself by preparing the praline a day or two ahead. Then make the cupcakes several hours (or even a day) before you want to serve them, and frost an hour or 2 ahead. Caramelize the bananas at the last moment if you want to use them. Otherwise simply add a piece of peanut praline on top of the frosting. NOTE I truly love the peanut butter and garam masala flavor pairing here, but these cupcakes are also wonderful without the latter, if you prefer. Over a large mixing bowl, sift together the flour, Garam Masala, baking powder, baking soda, and salt. Reserve. Using a stand mixer, beat the butter and sugar until very light and creamy, a full 5 minutes. Add the peanut butter and vanilla, and thoroughly combine. With the machine running at medium-high speed, slowly drizzle the egg into the batter, letting each bit fully incorporate before adding the next. Using short, slow bursts of the mixer, blend in the flour mixture in three additions, alternating with 2 additions of buttermilk. Mix as briefly as possible to combine the ingredients while not over activating the gluten in the flour. 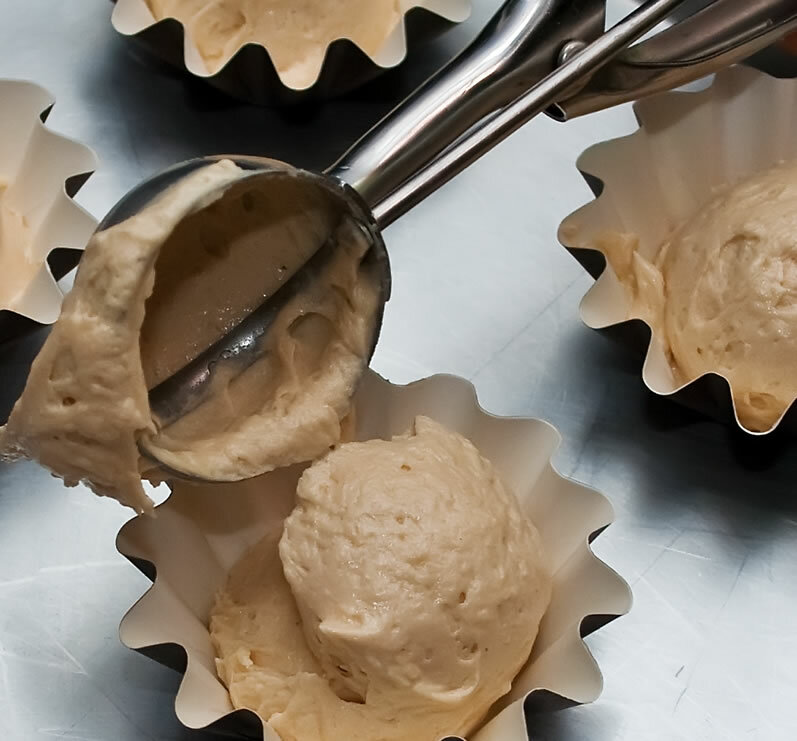 Using a 4 tablespoon, release-style ice cream scoop, scoop batter into two 12-cup muffin pans lined with standard-size cupcake liners. Bake at 350° for 23-25 minutes, until cupcakes are lightly browned on top and a toothpick inserted in the center comes out almost clean. Remove to wire racks to cool completely before frosting. Cupcakes keep for 1-2 days in an airtight container at room temperature. 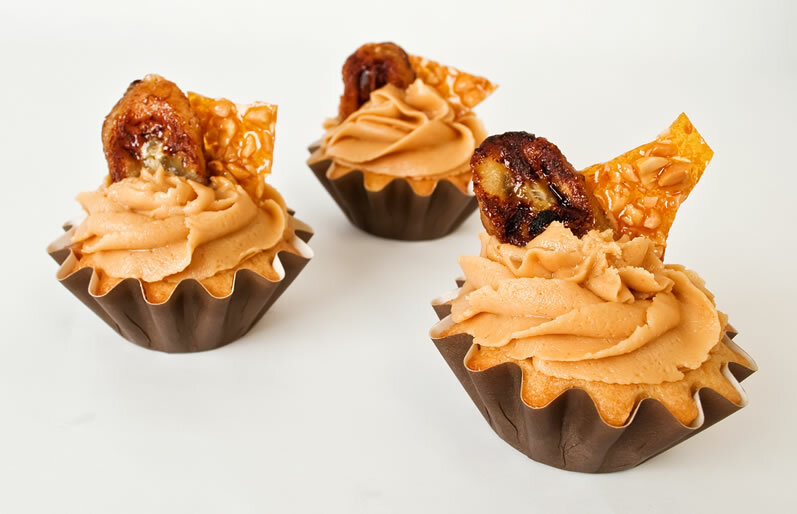 Praline is a delicious, lean (no butter) caramel and nut powder that is often used in desserts. Although this amount is more than you will probably need for this recipe, it is nice to have on hand. Store the powder in an airtight container; it keeps for months. Mix the sugar and water in a small saucepan and set over medium-low heat. Stir constantly until the sugar dissolves and the syrup clears. To prevent crystallization, do not rush this first step; use a pastry brush dipped in cold water to wash down the sides of the saucepan. When the sugar is fully dissolved, raise the heat, bring the syrup to a boil, and stop stirring. Continue cooking until the syrup turns an amber color (almost the same color as dark honey). An instant-read thermometer will read 340°. 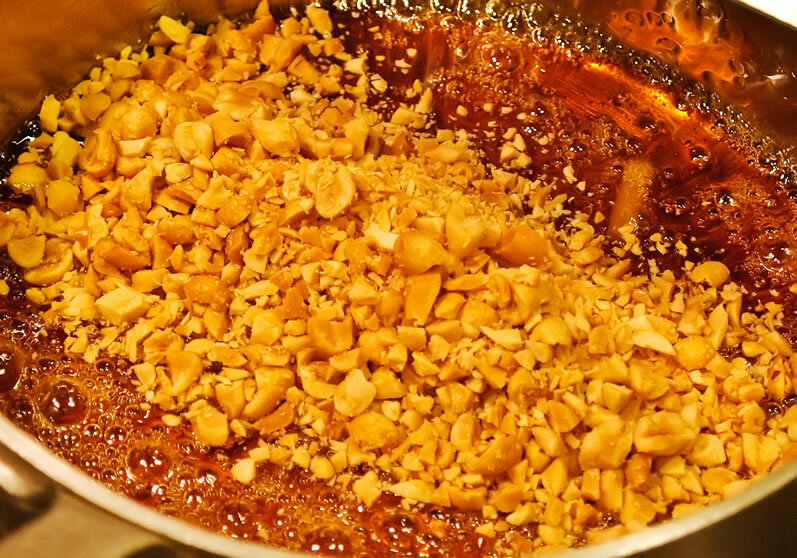 Add the peanuts and stir gently with a metal utensil. 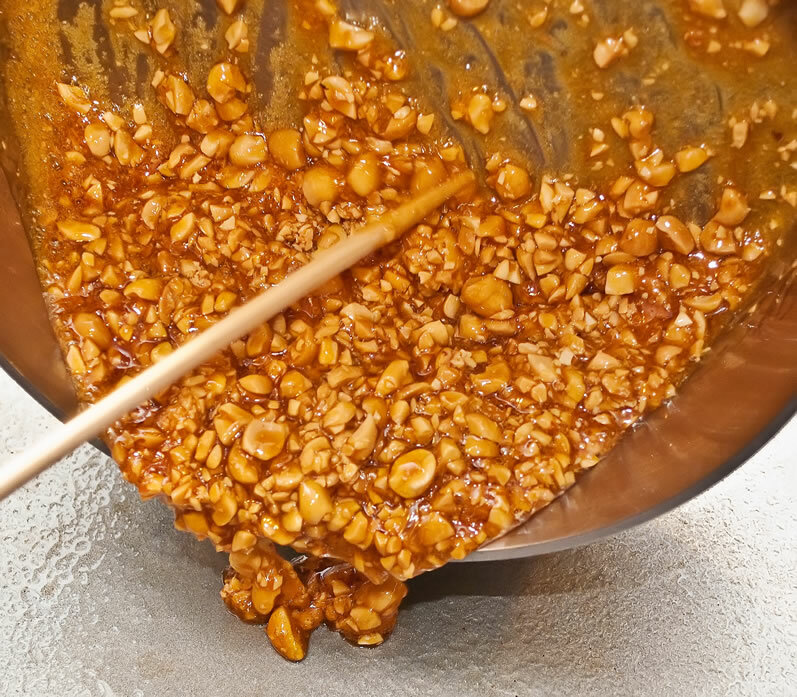 Pour this mixture onto a buttered baking sheet and let cool to a nut brittle. When hard and cool, break the brittle up into shards and serve as a garnish or pulverize in a food processor, in which case the mixture should be very fine. Makes 1 cup praline powder. 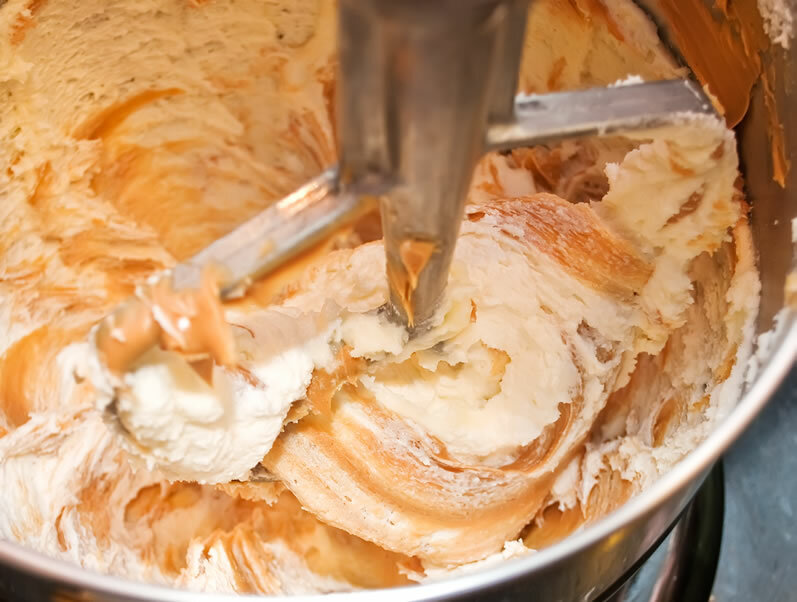 Using a stand mixer, cream the peanut butter, butter, and powdered sugar until smooth and light. If you plan to pipe the frosting, scoop it into a plastic piping bag fitted with a large star tip. You will likely need 2 piping bags for this much frosting. Otherwise, simply spoon it into a bowl. In either case, refrigerate until shortly before you want to use it. Allow to come to room temperature for about ½ hour before using. 3 firm, barely ripe bananas, peeled, and cut into 24, ¼-inch-thick slices on a slight diagonal. Melt 1 tablespoon of butter in a small sauté pan and when hot, dip each of 8 banana slices in sugar and add to the pan. Sauté for a minute or so on each side, just to caramelize the sugar. Don’t overcook the bananas or they will be too soft to hold their shape on top of the cupcakes. With a small offset spatula, remove the banana slices to a sheet of parchment paper and let cool completely. Remove the butter from the sauté pan with a paper towel and repeat the process twice more. Makes 24 caramelized banana slices. This was definitely one of the more difficult recipes but the pay off was sure delight. I worked all the way through even caramelizing bananas for the first time. Directions were perfect! will this recipe works without the garam masala? thanks! Those two ingredients are my abso faves; will try…no need to make any comments…they have said it all!! Sistah Sue, you MUST make these cupcakes. Then invite all your friends over. They are that good! 🙂 Hope all is going well in sunny Arizona. My cousin recommended this blog and she was totally right … fantastic work! WOW. Fascinating flavor profile and STUNNING presentation. So impressive! Garam masala with peanut butter? I’m definitely intrigued, but when you add in carmelized bananas…Sold! Thank you for the great receipe and the wonderful pictures. I must admit I am not a big fan of peanut in sweets but Your pictures have convinced me otherwise. This sounds extraordinary – over here in England peanut butter is not used in as many sweet recipes, but I think my family would like this so I’m going to have a go at it! Better than in my dreams! I want one! Oh my goodness that looks good! Perfect cupcakes, perfect photos and perfect little wavy muffin tins.